Perfect lines for top all-terrain performance. From its minimalist, tapered visor at the front to the slim points at the back, the Veleno's bsleek proportions are perfectly balanced. The markings positioned inside the front air intakes, and not on the shell, accentuate even further the pure lines of its aggressive profile which distinguishes the Veleno from other XC helmets. Sizes : M 54-57 cm ; L 58-61 cm. Weight : M 290 g ; L 310 g.
Certified EN 1078 and AS/NZS2063. 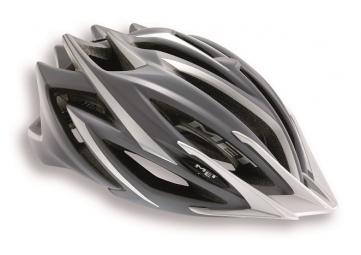 Casque Met VELENO 2014 Gris est évalué 5.0 de 5 de 2.